In a recent comment on my Blueberry Spinach Green Smoothie recipe a reader revealed their version of this smoothie, with Special K Protein Shake as the liquid base. I’d never heard of Special K Protein Shake and thus looked it up. It’s a weight loss drink by Kellogg that’s far from healthy. As a matter of fact, if someone snuck some into my home I’d immediately pour it down the drain where it belongs. One glance at the long list of ingredients and you should quickly be able to discern why this weight loss shake is unhealthy. So, I decided to create my own healthy Special K green smoothie rich in vitamin K and protein that will help you lose weight, and improve your health. Vitamin K, a fat soluble vitamin, isn’t a superstar like C or D, but it’s important you get ample amounts in your diet for the following reasons. 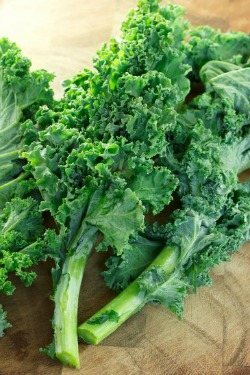 Signs of vitamin K deficiency include easy bruising, excessive bleeding, bone fractures, and calcification of the arteries. Green leafy veggies such as kale, spinach, Swiss chard, and collard greens are going to be your best source of vitamin K. Drink green smoothies on a regular basis and you won’t have to worry about getting enough vitamin K.
Because this smoothie is named Special K, it’s only appropriate that I used kale to green things up. Feel free to substitute spinach or another green. Also, omit the protein powder if you don’t need it. Enjoy! Load all the lovely ingredients into your blender and blend for around 30-45 seconds or until your desired consistency is reached. Let me know what you think of this Special K Protein Green smoothie by leaving a comment below. Happy Blending!